CAN'T I JUST USE A STRAW BALE? Nope! Modern bows shoot much MUCH harder than early bows. A high-tech modern compound will generally blow right through a bale of hay, straw, alfalfa, etc. You need a target with sufficient density to stop an arrow with 60+ ft-lbs of KE, so that means targets have to be a lot tougher than a bundle of grass. But there's a catch. Unlike bullets, arrows get retrieved and reused again and again. They are generally not consumed with each shot (which is fortunate since good carbon arrows can cost $7-12 each). So your target cannot be a material which will damage the arrow and/or make arrow retrieval impossible (wood, earthen mounds, old tires, etc.). What we're saying is, the era of the homemade archery target is basically over. In most cases, you'll just end up with damaged or lost arrows. If you're buying a modern high-tech compound, you need an appropriate practice target. It doesn't have to be elaborate or expensive, but it needs to be designed to deal with the KE your bow (or crossbow) delivers. 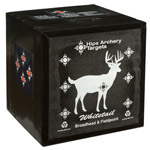 A typical archery practice target is a portable "block" or "bag" style target a little larger than a milk crate. The choice varies here by price, purpose and preference, but we caution you about trying to go the cheap'o route at the local Super-Mart. You'll be sorry. Just because a target looks like a high-density target for modern compounds or crossbows, that doesn't mean it performs like one. A few stores import cheap'o (sub $30) targets that won't last an hour against a modern compound. Don't waste your money. Get a decent target and it will last you a long time.